We export Trailing cables to Afghanistan, Albania, Algeria, American Samoa, Andorra, Angola, Anguilla , Argentina, Armenia, Aruba, Australia, Austria, Azerbaijan, Bahamas, Bahrain, Bangladesh, Barbados, Belarus, Belgium, Belize, Benin, Bermuda, Bhutan, Bolivia, Bosnia-Herzegovina, Botswana, Bouvet Island, Brazil, Brunei, Bulgaria, Burkina Faso, Burundi, Cambodia, Cameroon, Canada, Cape Verde, Cayman Islands, Central African Republic, Chad, Christmas Island, Cocos (Keeling) Islands, Colombia, Comoros, Congo, Congo, Costa Rica, Croatia, Cuba, Cyprus, Czech Republic, Denmark, Djibouti, Dominica, Dominican Republic, Ecuador, Egypt, El Salvador, Equatorial Guinea, Eritrea, Estonia, Ethiopia, Falkland Islands, Faroe Islands, Fiji, Finland, France, French Guiana, Gabon, Gambia, Georgia, Germany, Ghana, Gibraltar, Greece, Greenland, Grenada, Guadeloupe (French), Guam (USA), Guatemala, Guinea, Guinea Bissau, Guyana, Haiti, Holy See, Honduras, Hong Kong, Hungary, Iceland, India, Indonesia, Iran, Iraq, Ireland, Israel, Italy, Ivory Coast (Cote D`Ivoire), Jamaica, Japan, Jordan, Kazakhstan, Kenya, Kiribati, Kuwait, Kyrgyzstan, Laos, Latvia, Lebanon, Lesotho, Liberia, Libya, Liechtenstein, Lithuania, Luxembourg, Macau, Macedonia, Madagascar, Malawi, Malaysia, Maldives, Mali, Malta, Marshall Islands, Martinique (French), Mauritania, Mauritius, Mayotte, Mexico, Micronesia, Moldova, Monaco, Mongolia, Montenegro, Montserrat, Morocco, Mozambique, Myanmar, Namibia, Nauru, Nepal, Netherlands, Netherlands Antilles, New Caledonia (French), New Zealand, Nicaragua, Niger, Nigeria, Niue, Norfolk Island, North Korea, Northern Mariana Islands, Norway, Oman, Pakistan, Palau, Panama, Papua New Guinea, Paraguay, Peru, Philippines, Pitcairn Island, Poland, Polynesia (French), Portugal, Puerto Rico, Qatar, Russia, Rwanda, Saint Helena, Saint Kitts and Nevis, Saint Lucia, Saint Pierre and Miquelon, Samoa, San Marino, Saudi Arabia, Senegal, Serbia, Seychelles, Singapore, Slovakia, Slovenia, Solomon Islands, Somalia, South Africa , Taiwan, Tajikistan, Tanzania, Thailand, Togo, Tonga, Tunisia, Turkey, Turkmenistan, Tuvalu, Taiwan, Turkey, Vanuatu, Venezuela, Vietnam, Yemen, Zambia & Zimbabwe. Product Specification: We hold expertise in offering supreme quality Trailing Cables . These cables are widely demanded by our customers for their excellent conductivity and durability. The cables are demanded by various known companies like, ABB, JSW ISPAT as our Trailing Cables is approved by the IS : 9968 (Pt-1)/88 ISI standards. Quality silicon rubber is used for insulation to protect the cables from water and ensure high tensile strength. We BHUWAL CABLES are considered to a most trusted named engaged in offering an extensive range of EPR Trailing Cables. Using superior quality of raw materials and contemporary technologies these cables are manufactured. We have a team of well trained laborers who design these cables wires under the guidance of our professional experts. Our clients can avail these from us with various specifications that too at market leading rates. We BHUWAL CABLES introduce ourselves as one of the noted manufacturer, trader, exporter and supplier of Trailing Cables. The best quality of raw material in a perfect ratio is used to manufacture our offered cables. These cables are precisely tested for tested conductivity, tensile strength by our dexterous professional which helped us to come up with such distinct range. These cables are available in full range of sizes and shapes at industry-leading prices. We introduce ourselves as one of the noted manufacturer, trader, exporter and supplier of Trailing Cables. The best quality of raw material in a perfect ratio is used to manufacture our offered cables. These cables are precisely tested for tested conductivity, tensile strength by our dexterous professional which helped us to come up with such distinct range. These cables are available in full range of sizes and shapes at industry-leading prices. In keeping with the company's commitment to technological advancement, elastomer materials such as Polychloroprene (PCP), Chloro-Sulphoneted Polyethelene (CSP), Nitrile Rubber / PVC blends, Ethylene Propelene Rubber (EPR), Ethylene Vinyle Acetate (EVA) and Silicone have been specially compounded to meet numerous heat oil and fire resisting requirements. In the recent years Bhuwal has also developed special Elastomeric Fire Survival Cables for power, control and instrumentation wiring. 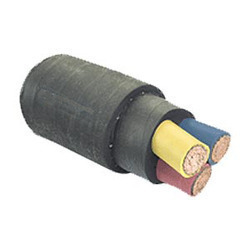 Elastomer (rubber) is an insulating material with high dielectric strength having a decent property of flexiblity ,the Elastorneric cables are suitable for applications for electric iron leads , reeling &unreeling application in mining, heater leads ,elevators cranes & other high dielectric & flexible application.The BHUWAL CABLES LTD are manufactures wire and cables to IS 9968 (Part-1) /1988 & Part -II ,IS 14494 , IS 9857/1990 For Welding Cables. Elasomeric cables and flexible cords for power and lighting. Welding cables (General purpose and HOFR types). We are manufacturing a wide range of trailing rubber cables that has been manufactured with high quality raw material. We use quality elastomer materials such as Polypropylene, Chloro-Sulphoneted Polyethylene (CSP), Nitirile Rubber/ PVC blends, Ethylene Polypropylene Rubber (EPR), Ehtylene Vinyle Acetate (EVA) and Silicone, that have been specially designed to meet numerous heat oil and resisting requirements. These electrometric compounds for insulating and setting of cables are formulated to meet the requirement of IS 6380 6899, IEC 60502 and other international specification. Owing to our vast experience in this field,Bhuwal Cables are able to manufacture and supply high quality Trailing Rubber Cables. Made using top quality annealed copper and elastomer compound, these cables are very durable and heat resistant. Our huge infrastructure facility is equipped with high-tech machines and technology. We manufacture these cables following modern techniques to obtain the right quality cables. The Trailing Rubber Cable is mainly used for trailing, festooning, mobile machines and cranes. Natural or synthetic fibres or elastomer suitable for the operating temperature and compatible with the insulating material. General Service sheath Type SE1/SE2 of IS 6380-1984Heavy Duty Sheath Type SE3/SE4 of IS 6380-1984. Reeling unreeling, Trailing, Festooning, Mobile Machines, Cranes, Coal Handling, Conveyors Belts, Gantry Cranes, Double, Over Head cranes, EOT Cranes, Container Handling Cranes. Mining Large complex machinery in mining industries require medium voltage flexible reeling and trailing cables for power supply and are suitable for operations under extreme conditions. At Bhuwal Cables, we have invested in the most up-to-date plant and equipment ensures our ability to manufacture high quality products including power distribution cables, flexible trailing cables, flexible auxiliary cables as well as other specialist mining cables designed and produced to your requirements. We are reckoned manufacturer and supplier of wide assortment of Nitrile Trailing Cable. Our offered wire finds its application in electronic industries for making electronic appliances and tools. This wire is manufactured using optimum grade silicon with the help of high-tech techniques in compliance with set industry norms. Moreover, it is checked for its quality on series of quality parameters before being supplied to our clients. Clients can avail this wire from us at pocket friendly price. Our company “Bhuwal Cables” is India’s renowned Manufacturer & stockist of a wide range of Elastomeric Cables (Rubber Cables). We have more than 26 years of vast experience in Cables and Wires. Elastomer (rubber) is an insulating material with high dielectric strength having a decent property of flexiblity ,the elastorneric cables are suitable for applications for electric iron leads , reeling &unreeling application in mining, heater leads ,elevators crane & other high dielectric & flexible application. The bhuwal cables ltd are manufactures wire and cables to is 9968 (part-1) /1988 & part -ii ,is 14494 , is 9857/1990 for welding cables. There are various type of compounds according to the grade & properties as per is:6380 such as a general purpose, heat resisting & high temperature insulation. The elastomeric cables are suitable for use where the combination of ambient temperature & temperature - rise due to load remains stable up to the following limits in the conductors. Bhuwal cables ltd is one of the leading manufacturers of varieties of elastomeric cables made of natural and various types of synthetic rubber compounds. The compounds based on epr, csp,nbr-pvc,eva,silicon are made in the most modernised plant by highly skilled hands to suit the specific operational regiments, continous r & d and upgraded production technology are the main features of elastomeric cables division at bmi. The cables are manufactured in compliance with every national and international standards. The design engineers at bcl renders every assistance to the customer in designing a cables for any critical application elasomeric cables and flexible cords for power and lighting. Elastomer (rubber) is an insulating material with high dielectric strength having a decent property of flexiblity ,the Elastorneric cables are suitable for applications for electric iron leads , reeling &unreeling application in mining, heater leads ,elevators cranes & other high dielectric & flexible application.The BHUWAL CABLES LTD are manufactures wire and cables to IS 9968 (Part-1) /1988 & Part -II ,IS 14494 , IS 9857/1990 For Welding Cables. There are various type of compounds according to the grade & properties as per IS:6380 Such as a general purpose, heat resisting & high temperature insulation. The elastomeric cables are suitable for use where the combination of ambient temperature & temperature - rise due to load remains stable up to the following limits in the conductors. BHUWAL CABLES LTD is one of the leading manufacturers of varieties of Elastomeric Cables made of Natural and various types of Synthetic rubber compounds. The compounds based on EPR, CSP,NBR-PVC,EVA,Silicon are made in the most modernised plant by highly skilled hands to suit the specific operational regiments, continous R & D and upgraded production technology are the main features of Elastomeric Cables Division at BMI. The cables are manufactured in compliance with every National and International Standards. The Design Engineers at BCL renders every assistance to the customer in designing a cables for any critical application Elasomeric cables and flexible cords for power and lighting. Welding cables (General purpose and HOFR types). We introduce ourselves as one of the noted manufacturer, trader, exporter and supplier ofTrailing Cables. The best quality of raw material in a perfect ratio is used to manufacture our offered cables. These cables are precisely tested for tested conductivity, tensile strength by our dexterous professional which helped us to come up with such distinct range. These cables are available in full range of sizes and shapes at industry-leading prices. 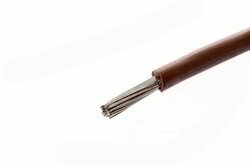 We are recognized as one of the major manufacturers and suppliers of an extensive range of TRS Welding Cable. We use superior quality raw material and sophisticated technologies in manufacturing these cables and wires. These are available in various sizes, thickness and length. We offer these products to our customers at reasonable price range along with best services on time.